Dr. Saluja diagnosed a few problems on my skin in minutes. In fact, a different dermatologist I have seen for yearsincorrectly diagnosed a mole I have on my collar bone. Dr. Saluja stated he could eliminate the mole; however it was a cosmetic procedure! Fabulous! Highly recommend Dr. Saluja---Milford, CT is fortunate to have him! Dr. Saluja diagnosed a few problems on my skin in minutes. In fact, a different dermatologist I have seen for years incorrectly diagnosed a mole I have on my collar bone.Dr. Saluja stated he could eliminate the mole; however it was a cosmetic procedure! Fabulous! Highly recommend Dr. Saluja---Milford, CT is fortunate to have him! Fantastic doctor and bedside manner. Had a spot that needed to be removed and it was lasered off. The spot iscompletely gone! Thank you! Fantastic doctor and bedside manner. Had a spot that needed to be removed and it was lasered off. The spot is completely gone! Thank you! ALERT: If you would like to cancel or reschedule your appointment, we require at least 24 hours notice. If you do not cancel your appointment within 24 hours of your scheduled appointment, you will be marked as no-show on Zocdoc and are subject to a cancellation fee. Dr. Sandeep Singh Saluja is a board-certified dermatologist who completed the prestigious Laser and Cosmetic Surgery Advanced Fellowship at Harvard Medical School, Massachusetts General Hospital and Wellman Center for Photo-medicine – the world’s leading research center, where the majority of today’s laser and cosmetic technologies are invented and tested. Dr. Saluja is thrilled to move back to CT and join the Connecticut Skin Institute making it the only practice in Connecticut or Westchester County that has two Fellowship-trained Cosmetic and Laser Surgeons. At Connecticut Skin Institute, Dr. Saluja will focus his practice on both medical and laser/cosmetic dermatology, while placing a strong emphasis on patient education. He has extensive experience managing the total skin health of his patients and has performed hundreds of aesthetic procedures. 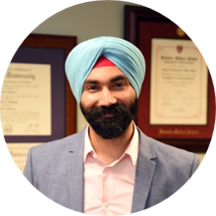 Dr. Saluja has been routinely invited to speak at national professional meetings and has published numerous peer-reviewed articles on laser, cosmetic and general dermatology. He was also selected to serve on the Board of American Society for Laser Medicine & Surgery (ASLMS). He was the recipient of a highly competitive research grant from the American Society of Dermatologic Surgery (ASDS) to evaluate laser and energy based devices for acne scars in ethnic skin. Dr. Saluja believes in looking and feeling your best at any age. Very pleasant experience! The wait time was very appropriate and quick. Explained everything and answered all my questions. Would def recommend. Great experience - prompt and professional. Dr. Saluja is the best dermatologist in CT. He was attentive, smart and answered all my questions. His staff is also very kind and on top of things. It is a modern office and really value a patient’s time. I cantell they don’t double triple book patients and that is very much appreciated. I highly recommend! Dr. Saluja seemed quick and efficient without actually rushing things. He listened and actually seemed to be interested (unlike other dermatologists I have seen). He was very knowledgeable and helpful with my examination and questions for future work on my age spots. I will definitely be back to have that work done after my vacation. Dr. Saluja was fantastic. I was very nervous and shy for my visit because of a skin issue in a private place. Dr. Saluja was very professional and had a calming presence. Wait time was super quick. I highly recommend! My visit with Dr. Saluja is perhaps the most efficient medical I have had. I was in and out of his office within 30 minutes for a wart removal. I was very nervous during my appointment as I had never hada wart before nor had one removed. Quite honestly, I was a bit nauseated by the sight and thought of having a wart. Dr Saluja was very calm, reassuring and nonjudgmental during my visit. He explained everything from how one gets a wart to the removal procedure very clearly and he treated the issue right away. It is also important to note that his office is clean and modern and the staff are courteous and professional. I would highly recommend this provider to others. Actually took time. First time in YEARS a docs appt started when it was supposed to.